A guidelines-based set of practices for all aspects of software development from architecture to specific technologies to deployment. 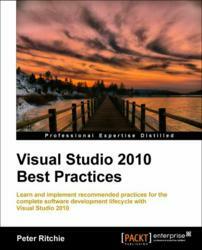 Packt is pleased to announce the arrival of Visual Studio 2010 Best Practices, a step-by-step tutorial providing .Net developers with useful techniques to develop applications using C# with Visual Studio. This book is available now in print, eBook, Kindle and select library formats. The print book comes in at over 280 pages and is competitively priced at $35.99, whilst the e-book and Kindle versions are available for $20.39. Peter Ritchie is the president of Peter Ritchie Inc. Software Consulting Co. a software consulting company that specializes in windows-based software development management, process, and implementation consulting. He has immense experience ranging from designing and implementing to architecting from C++ to C#. Microsoft Visual Studio is used to develop console and graphical user interface applications along with windows forms applications, web sites, web applications, and web services in both native code and managed code. It can be used on all platforms supported by microsoft windows, windows mobile, windows CE, .NET framework, .NET compact framework and microsoft silverlight. Visual Studio 2010 Best Practices covers all the essential areas of Visual Studio such as advanced C# syntax and asynchronous programming in C#. This book delves into step-by-step instructions that highlights various techniques to design multi-threaded, parallel and distributed systems, and learn better ways to develop web services with WCF and design automated tests. Along with providing consolidated reference of varied practices and using tips and tricks to test complex systems, readers will also learn to understand proven ways of deploying software systems in windows and learn source code control. The book is a step-by-step tutorial that discusses best practices and is structured in such a way that it can be read both from start to end or can be dipped into. All Mircosoft books are published by Packt Enterprise. Packt Enterprise is a publishing division of Packt Publishing designed to serve the information needs of IT Professionals in the Enterprise space. Packt Enterprise also publishes on Microsoft, IBM, Oracle, Citrix, Java, Amazon, Google and SAP technologies.